Location: Platforms were on the east side of St Lukes Road. The booking office, at street level, was on the west side. Present state: Demolished the site of the Wigan has been developed for housing but a plaque marks the stations location. The site of the Preston platform is clearly visible with the widening of the track to accommodate the platform. Notes: The station was opened by the Lancashire & Yorkshire Railway (LYR) as Barton Street on 2 July 1883. It was less than a mile from Southport, on the Southport Chapel Street to Wigan line, opened in 1855. The station was on the east side of a road overbridge (opened in 1880) and became known locally as St Lukes Road. In October 1883 the station was renamed Southport St Lukes Road. Steps led down to a wide island platform, where a collection of buildings housed the station’s facilities. When it opened trains running between Southport and Wigan, and onwards to Manchester, and to and from Ormskirk called at the station. town so they obtained an Act on 1 July 1898 that conferred powers to make alterations whereby trains on the former WLR could use Southport Chapel Street. 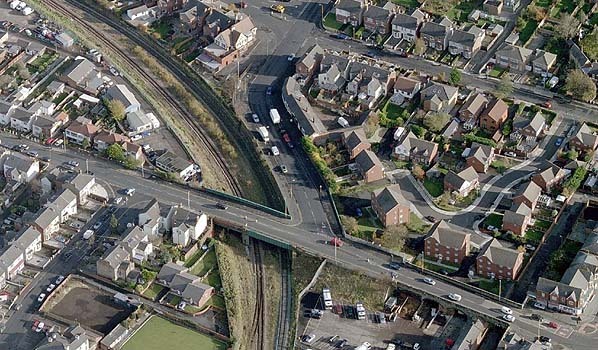 The closest point where the former WLR approached the Southport - Wigan line was on the western side of St Lukes Road bridge where Ash Street station stood; this location was chosen for the new St Lukes Junction. Ash Street would have to be closed, and the LYR decided to remodel St Lukes station by adding a platform on the former WLR. To facilitate all of this work a temporary platform was erected on the former WLR east of St Lukes Road bridge. It carried the name Ash Street and was reported in the local press as being ready for use by 23 March 1901. Work then began on creating an island platform on the former WLR and on remodelling the station’s entrance. The original platform on the Wigan line was extended slightly to the west under St Lukes Road bridge. It is uncertain when the new facilities were completed, but a newspaper report from 16 January 1902 mentioned that there were only six weeks to go until the new St Lukes station would be complete. The same article stated that ‘Ash Street is a thing of the past’. The new island platform on the former WLR was possibly brought into use early in 1902 before the works at St Lukes were completed. The new facilities were well advanced by 3 February 1902 when passengers first used the new entrance. The new island platform was definitely in use by this date as the newspaper reported that tickets could be booked from it. 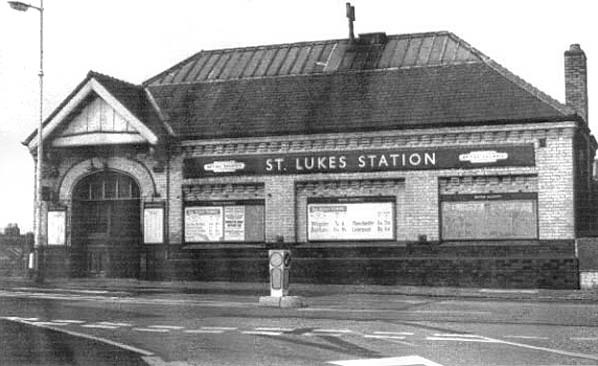 The station was renamed Southport St Lukes on 1 March 1902. The rebuilt St Lukes’ main entrance was on the west side of St Lukes Road bridge, on the site of the former Ash Street station entrance. The building was sandwiched between the Wigan and Preston lines. It was an unremarkable structure with a hipped slate roof, but interest was added by the contrasting dark-brick dado and pale bricks above, and the arched doorway to the left, surmounted by a gable. A covered footbridge behind the building linked it to both the original Wigan line platform and the new Preston line platform. Steps led down to the platforms. The Preston platform also extended slightly under the road bridge at its western side; most of its length was on the eastern side. The Preston line platform possessed a single-storey timber building at about its mid-point, with canopies on either side. Further along the platform towards Preston another timber structure housed the gentlemen’s toilets. The new station would have had services to Southport Chapel Street from both island platforms; to Wigan, Bolton and Manchester from its original platform; and to Preston, Accrington, and Altcar & Hillhouse from its new platform on the former WLR line. By the early twentieth century popular residential districts had developed along the former WLR between Southport and Crossens. Consequently the LYR decided to extend the planned electrification between Liverpool Exchange and Southport Chapel Street onward via St Lukes (Preston line platform) to Crossens. The live rails reached St Lukes by 28 February 1904. On 6 March an electric train ran though St Lukes from Crossens to Liverpool. A full public service began on 5 April 1904. Initially the electric trains that served St Lukes were non-stop between Liverpool and Southport and then called at all stations between Southport and Crossens. On 13 February 1911 the LYR opened a connection from the Barton branch at Blowick, at what became Butts Lane Junction, to the Wigan line which passed under it at that location. The junction was east of the point where the lines crossed and was named Pool Hey Junction. This in effect created a loop which allowed Wigan trains to travel into Southport via the former WLR, which meant that they could serve Meols Cop station. As a result some Wigan line stopping trains used the Preston line platform at St Lukes from this time. On 23 December 1912 the Meols Cop Electric Car Sheds opened. They were just under half a mile north-east of St Lukes station in the Meols Cop triangle (formed by the junctions with the former WLR and the Barton branch). The opening of the electric car sheds at this location meant that a great deal of electric empty stock working passed through the Preston line platform. In May 1914 Southport St Lukes’ name was simplified to St Lukes. On 1 January 1922 the LYR was absorbed into the London & North Western Railway; a year later that company became part of the London Midland & Scottish Railway (LMS). In summer 1932 St Lukes had 9 weekday trains to Downholland (formerly called Barton), 38 electric services to Crossens and 20 continuing north of Crossens, mostly to Preston, and one service ran to Wigan Wallgate from the Preston line platform. Five weekday services ran to Bolton Trinity Street; 15 to Manchester Victoria; seven to Wigan Wallgate; 12 to Ormskirk; one to Burscough Junction; one to Burscough Bridge; and one to Preston via Burscough Bridge - all from the Wigan line platform. Nearly one hundred trains ran to Southport Chapel Street from St Lukes. With effect from 26 September 1938 the Downholland service was withdrawn; the last trains had run on Saturday 24 September. On 1 January 1948 St Lukes became part of the nationalised British Railways (London Midland Region). Electric lighting was installed at the station, probably in the LMS era, and BR (LMR) totem name signs were fitted, probably in the late 1950s. 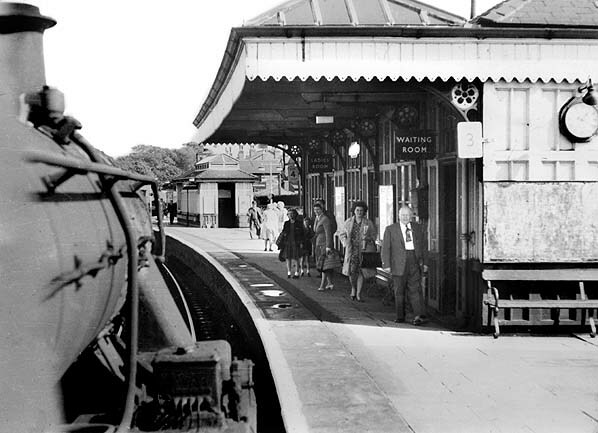 In September 1956 the majority of the local stopping services appeared to be using the Preston line platform including many of the Wigan and the Ormskirk services. Fast Manchester services mostly used the Wigan line platform. There were 31 weekday services for Crossens; 20 for Preston; also Manchester Victoria (10); Ormskirk (8); Wigan Wallgate (6); Rochdale (2); and one each for Accrington, Todmorden and Bolton Trinity Street. As in the 1930s there was no shortage of services to Southport Chapel Street. 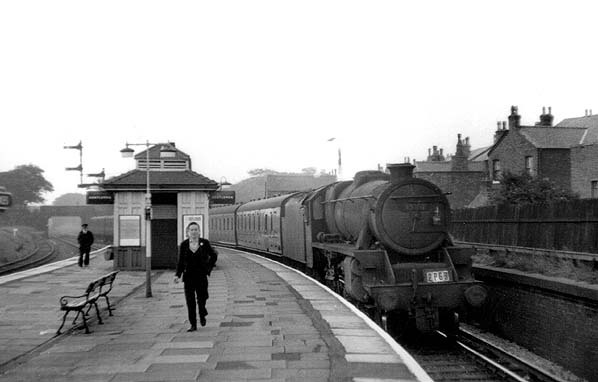 Ormskirk services from St Lukes ended with effect from 5 March 1962.
line had a notoriously busy level crossing at Blowick whilst the alternative route via Meols Cop did not. Despite local protest the Preston line passenger services were withdrawn on 7 September 1964, and the line closed as a through route. This left St Lukes with only Wigan line services; most stopping trains travelled via the Preston line platform. 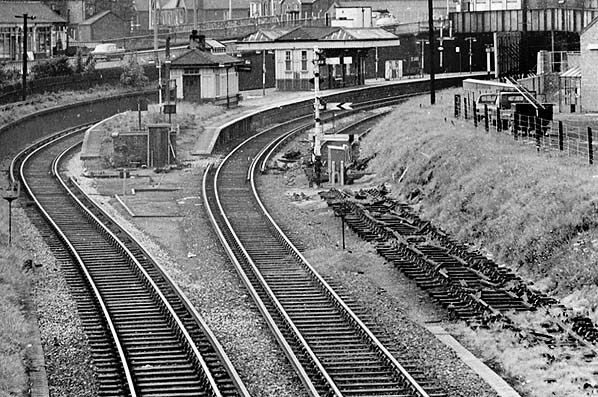 On 27 June 1964 the closure proposal for St Lukes Junction to Pool Hey Junction via Blowick was published; no ‘hearing’ was held to consider objections, and the line closed on 14 June 1965, including St Lukes Wigan line platform. Demolition followed very quickly and the line was lifted by the end of 1965. The former Wigan line platform had been demolished by 1967 and the bridge to its west bricked in. St Lukes was left with only a sparse Wigan line stopping service that used the Preston line platform. It lost many of its passengers who no longer had the same journey opportunities. 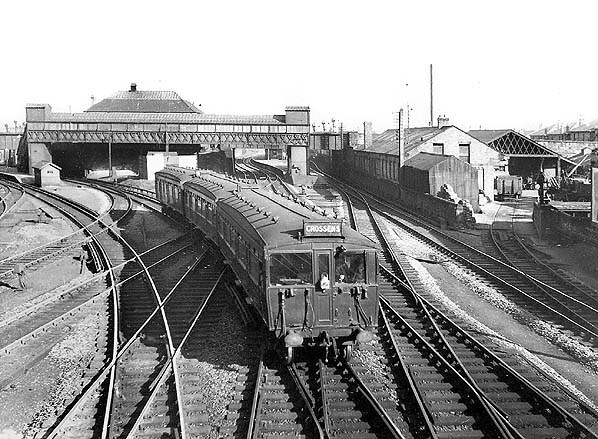 Although the Manchester Victoria – Wigan Wallgate – Southport route was not threatened with closure by Beeching, on 25 May 1967 British Rail published a closure proposal. 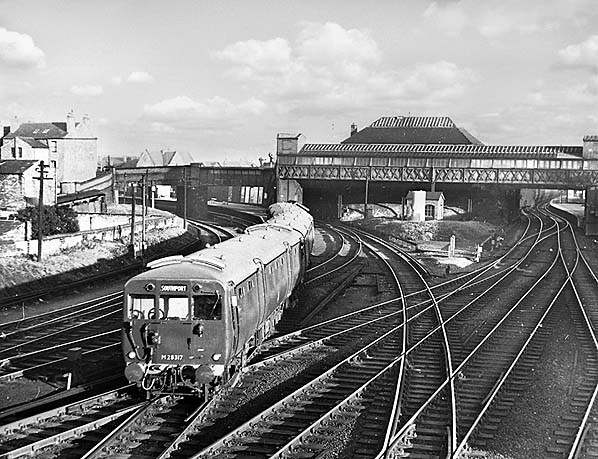 On 27 May 1968 the Minister of Transport rejected the proposal, except for St Lukes Station which closed completely with effect from 8 September 1968. 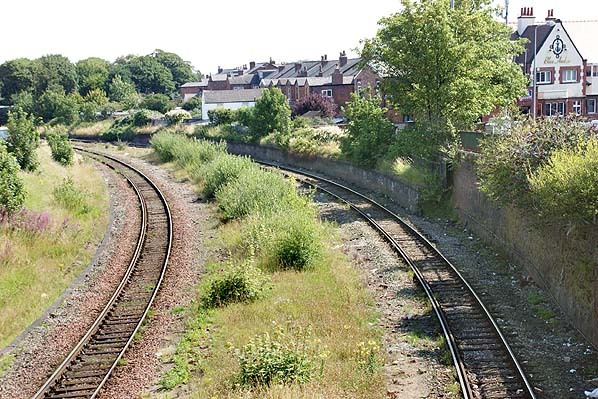 In 2011 the site of the Preston platform could be seen clearly as the tracks of the original WLR are quite widely spaced at this point; it survived until the 1980s. The Wigan platform site had been developed with apartments, as had the entire route of the former direct line to Wigan between St Lukes Junction and Pool Hey Junction. A small section of the booking office could still be seen on the west side of St Lukes Road in July 2011, even though a new bridge had opened adjacent to it a few months earlier. For more bout Altcar Bob see the Southport.gb.com web site. 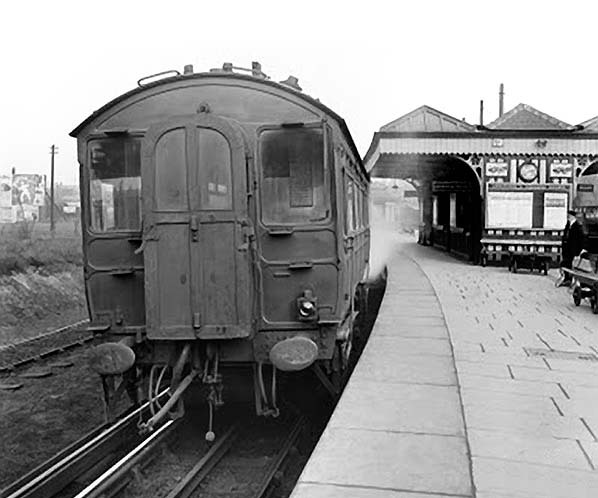 The railmotor known as ‘Altcar Bob’ which operated on services between Southport Chapel Street and Downholland is seen at St Lukes Preston-direction platform in the late 1920s. The railmotor was on a service to Downholland. After leaving St Lukes it would fork to the east at the Meols Cop Triangle and join the former Liverpool Southport & Preston Junction Railway. The remodelled St Lukes station as seen on a 1911 1:2,500 OS map. By this time a platform had been added on the former WLR line. A new booking office had also been provided on the road overbridge. St Lukes station as shown on a 1928 1,2500 OS map; little has changed since 1911. Looking east towards St Lukes station from Windsor Road footbridge in April 1939. An EMU of LYR vintage had just departed from the St Lukes Preston-line platform and was en route to Southport Chapel Street on a working from Crossens. The driver had forgotten to alter the destination blind to read ‘Southport’. The end of the St Lukes Preston platform can be seen to the far left. Directly ahead is the original St Lukes platform that served the Wigan line. The buildings to the right, served by a siding, were the Southport Corporation highways depot. Looking east from Windsor Road footbridge towards St Lukes station in October 1953. The LMS-built EMU of 1938 vintage is working a Southport Chapel Street to Crossens service and is approaching the Preston line platform at St Lukes, which can be seen under the bridge on the left. The Wigan line platform at St Lukes can be seen on the right. St Lukes station street level entrance c.1960s. 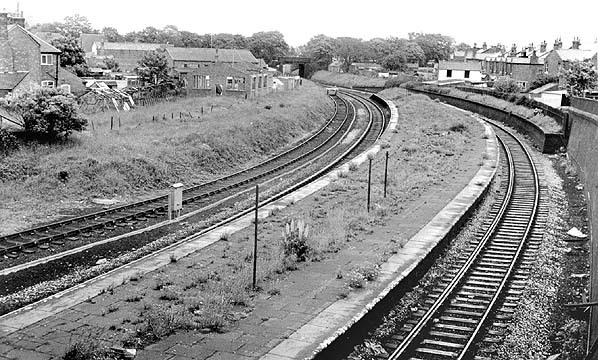 Looking north-east along St Lukes Preston line platform in August 1964. Locomotive number 45337 was arriving at the station on a Preston to Southport Chapel Street service. 45337 entered service as 5337 in April 1937. Built to the successful Stanier Black Five design by Armstrong Whitworth, it received the 4 prefix at nationalisation when it was shedded at 26B, Agecroft. Only six months after this picture was taken the locomotive was withdrawn, in February 1965, from Carlisle Kingmoor. The gentlemen's timber-built toilets on the Preston line platform are clearly shown. Also of interest is the live rail used by Crossens electric services. Looking south towards St Lukes station’s Preston line platform in early September 1968. At this time it was no longer possible to travel along the Preston line which had been closed for four years. Only Wigan line trains called, and within a week the station would close completely. The line through the station was still electrified but no passenger electrics ran. The live rails were retained for access to the electric car sheds at Meols Cop. St. Lukes station (Preston platform) looking east in June 1976. 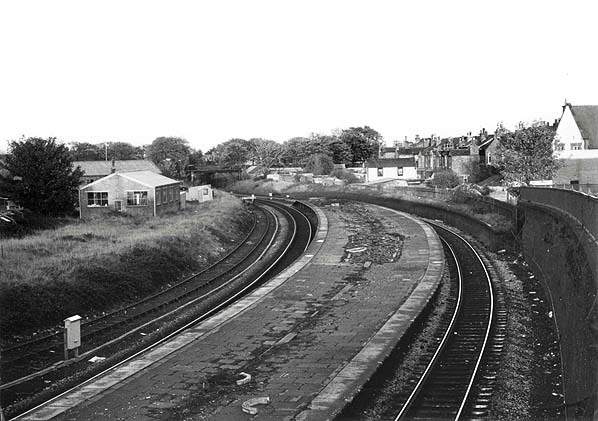 St Lukes station's Preston line platform looking east in October 1982 fourteen years after it had closed. This platform was the last one to open and to close having survived until 1968. The Wigan line platform had closed four years earlier. 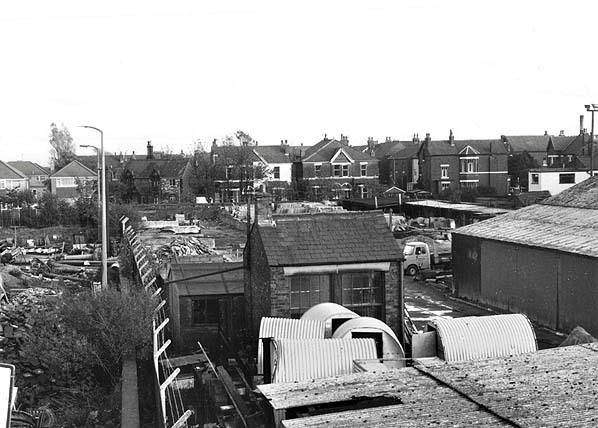 Looking east at the site of St Lukes station’s Wigan line platform (far left) in October 1982. By this time all traces of this platform had been swept away as had the route of the line running out through the eastern part of Southport. To the right is the site of the rail-served highways depot with a short section of loading platform in the distance. The building in the centre foreground is the weigh office. This has all been redeveloped for housing as can be seen in the aerial view below. Mid 2000's aerial view showing the site of the two platforms. The Preston line platform served the line curving to the left, which was above the bridge. Immediately to the right of the bridge there is a grass bank, which is the infilled bridge for the Wigan line. The platform was above the bridge where the new houses are seen. The extant bridge to the right was for the line running through the highways depot which was sited either side of the bridge. Looking east at the site of the former St Lukes Preston line platform in July 2011.